Students Speaking Out is a program of San Diego County Crime Stoppers a community-based nonprofit organization (501c3). Students Speaking Out was inspired by our Campus Crime Stoppers program which has helped to solve hundreds crimes on local school campuses and led to the safe removal of 12 guns from middle and high schools in San Diego County. The mission of Students Speaking Out is to empower young people to use their voices to make schools and communities safer. We believe that students can make a difference in bringing an end to senseless violence and dangerous activities that interfere with young people achieving their dreams. After working with far too many families who have lost a loved one to violence, drug abuse, and impaired driving we have seen the devastating impact of these activities on our community. Sadly, many of these losses could have been prevented. Our message to students is that your voice can make a difference. When you know about illegal or dangerous activity taking place; tell someone. Your voice might save a life, stop a crime, or get help for someone in need. At some point, most students will confront dangerous or even illegal activity at school or in the community. If you do, we want you to have several avenues for speaking out. Talk to a parent, a teacher, or a school police officer about what you know, or contact Students Speaking Out anonymously. On this website, we discuss some of the challenges you might encounter at school or in the community. We strongly encourage you to talk to your family and teachers about these issues. We have links to other websites that might have helpful information. Knowledge is power. Students play the most important role at your school in keeping your campus safe. Even though you are young, you can really make a difference. Bullying, substance abuse, relationship violence, and gang activity thrive in environments where bystanders tolerate activities that they know are wrong. There are real and serious consequences that can result from these activities. Speaking out can make a difference in one person's life or even your whole school. Your voice is powerful, you can use it to make your school safer for everyone. Thank you for visiting this website, as a parent you play the most important role in ensuring the safety and well-being of your child. This program was developed to support your efforts to help your child achieve their dreams. We welcome your feedback on the program. School safety is a primary concern for us all. We want our schools to be an environment where students are focused on learning and school activities. Students Speaking Out encourages young people to take a leadership role in making their school and community safer. Our message to students is to use their voices to make a difference. We strongly encourage young people to talk to their parents or other adults in their lives about the safety concerns they may have. Students Speaking Out provides a safe environment. 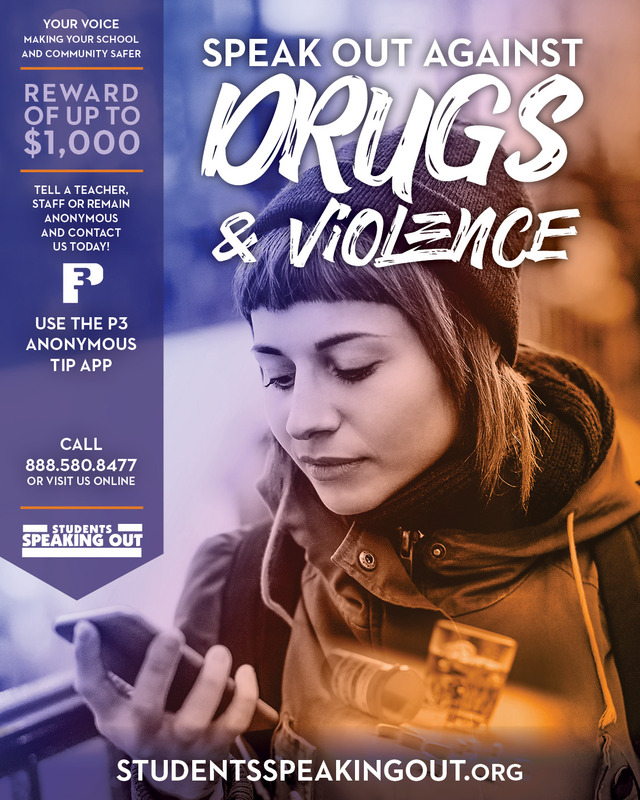 Our purpose is to offer students an avenue to report dangerous activities or crime anonymously and to provide incentives to do the right thing. Students Speaking Out was created with the goal of helping you spend more time preparing young people for leadership in the future. The program was designed to create opportunities for parents, educators, and students to have a dialogue about the choices they and their peers make. While no one wants dangerous activities or crime to be a topic in schools, unfortunately it is an issue that must be dealt with in our schools today. Students Speaking Out is a proactive approach to creating a safer school environment. Students Speaking Out can be utilized within the curriculum to teach character development. The program promotes school spirit, pride, and a positive campus image to students. 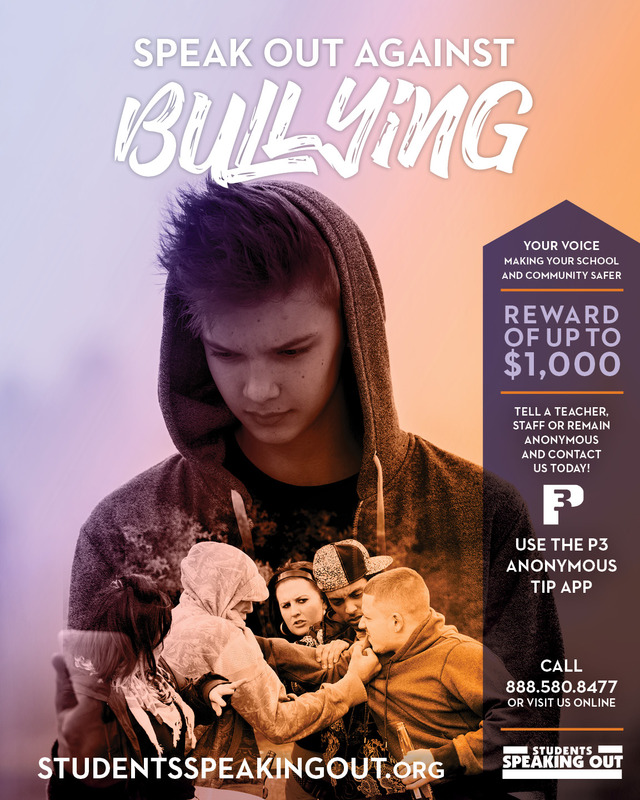 In addition to being a way students can safely report school crimes anonymously without fear of retaliation, this program encourages the development of responsibility. Students can participate in leadership roles while benefiting from a reduction in negative incidents on campus and enjoy an increased sense of security. 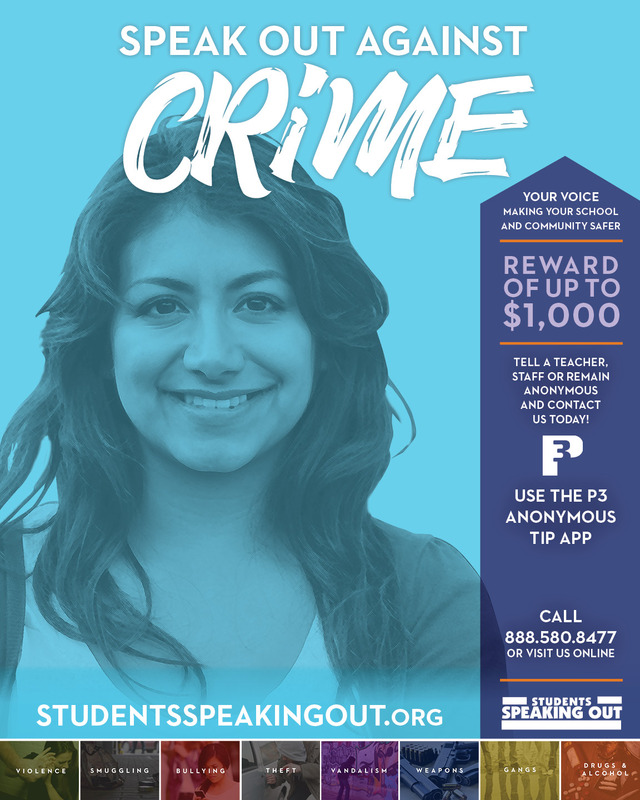 Student Speaking Out is a program of San Diego County Crime Stoppers. We welcome your suggestions and feedback on this program. Students Speaking Out is a program of San Diego County Crime Stoppers. This program is offered to school districts throughout San Diego County free of charge. Students Speaking Out is solely supported by the generous donations of individuals and companies committed to creating safer schools. We need your help to continue to offer this program to more than 250,000 students. Directed donations to Students Speaking Out go to pay for tip line costs, technology, website and social networking expenses, marketing materials for students, and training for school and law enforcement personnel. Since 1984, San Diego County Crime Stoppers has been helping law enforcement solve crime. We operate 3 anonymous tip lines where people can report crime by phone, text, or web tip. We offer rewards of up to $1,000 for information that leads to an arrest. Tips to Crime Stoppers have helped to solve more than 6,000 felony crimes including 136 homicides. You can also download the P3 App to have access on your phone at all times.